VIDEO: Cholita the abused ex-circus bear takes first steps to freedom! Cholita is an endangered Spectacled bear who was kept illegally by a circus. The scars of her abusive past are clear to see – her fingers were brutally cut down to stumps to remove her front claws and her teeth were broken, leaving her defenseless. The stress of her living conditions has also left Cholita suffering from severe hair loss – where she should have thick, black fur she has none, leaving her almost completely bald. Cholita was confiscated from a circus in Peru ten years ago and has been living in a zoo near Piura ever since, as no suitable permanent home could be found for her due to her poor health and lack of hair. Peruvian authorities requested that ADI find a home for Cholita, along with the 33 lions and a tiger saved during the ADI Operation Spirit of Freedom rescue mission, planned for rehoming at The Wild Animal Sanctuary in the US. Over the past eight months ADI has assisted Peru's wildlife officials with the enforcement of the country's ban on wild animals in circuses, and has started the same process to save animals from Colombia's circuses. ADI President Jan Creamer vowed not to leave Cholita behind and opened urgent negotiations with US authorities to secure her entry to the US. After meetings in Washington, the US Fish and Wildlife Service agreed that they wanted to help Cholita and worked with the Peruvian authorities to speed through her permit. However, Cholita’s need was urgent, so not waiting for the permits, ADI deployed a rescue team, sending trucks, cages, food and water for the 56 hour return journey to recover Cholita. Meanwhile a special holding unit was built for Cholita at the Spirit of Freedom rescue center – whatever the outcome of the permits, ADI would find a home for Cholita. Cholita’s journey to freedom began in what is believed to be the circus cage in which she used to live, which measures just 5 square feet. 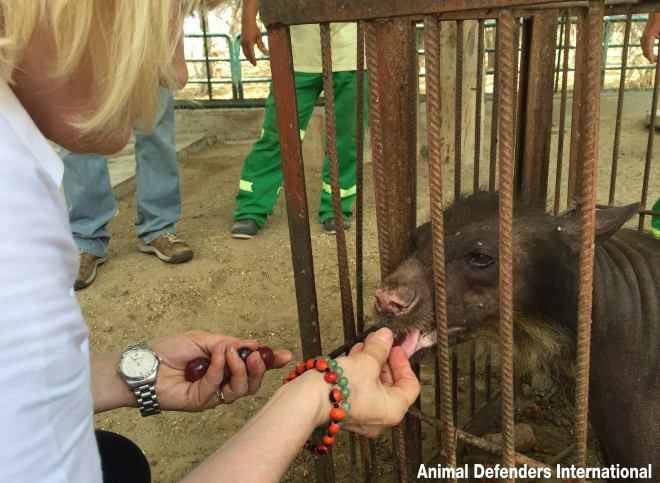 ADI President Jan Creamer fed the elderly bear pieces of banana to keep her calm and the team transferred her to a holding unit on the back of ADI’s truck. Cholita rushed from the rusted old cage into ADI's spacious travel crate and dug into a bowl of fruit before building herself a comfy nest of straw and blankets. ADI also took a lonely woolly monkey, Nena, to travel back with Cholita and join other rescued monkeys at their rescue center, who are headed for a new Amazon habitat. The ADI rescue team stopped every 2-3 hours to check on Cholita and Nena and eventually arrived at the ADI Spirit of Freedom rescue center near Lima late the following night after a 28-hour journey through the desert and mountainous roads. The frail, elderly bear is being given time to settle into her new temporary home under close observation from the ADI veterinary team to establish her state of health, before the last leg of her journey to freedom. Cholita’s rescue brings the number of animals saved by ADI since August last year, to 79. ADI has worked with Peru's authorities to raid circuses all over the country in the biggest rescue and enforcement operation of its kind. During the mission, the organization has also saved dozens of monkeys and other animals from the illegal wildlife trade. ADI's appeal to save Cholita is backed by the author of bestselling children's book series Paddington bear, Michael Bond. Operation 'Spirit of Freedom' is expected to cost ADI over $1.2 million, with the biggest single cost being the flight to the US, for which the organization has launched an international appeal for funds. The Spirit of Freedom flight comes with a hefty price-tag at $200,000 to hire the Boeing 767 cargo plane that will take Cholita to The Wild Animal Sanctuary in the US, along with a tiger and 24 lions from Peru and 9 lions from Colombia who will be collected during a stop-off in Bogota. Nearly 40 monkeys and other native wild animals have been relocated to jungle habitats built and funded by ADI at the Pilpintuwasi wildlife sanctuary in the Amazon. Please donate to help get Cholita and the other animals saved during Operation Spirit of Freedom to their forever homes: www.ad-international.org/CholitaAppealUS or 323-935-2234.